If you’ve read a few of my book hauls, then it’s no secret that I seem to get loads of books each week. Why? Because I am a major bo0k buying, borrowing and requesting addict. When it comes to books, I have absolutely no self-restraint whatsoever. This is my main shelf. My favourites are in the middle, my UKYA books at the bottom and the top shelf contains all the other books that don’t fit on my middle shelf. I’m planning on swapping things around soon because it needs clearing a bit. I really love my shelves and didn’t put them up until May this year. But because I’m so short, I need to stand on my bed to reach the top shelves sometimes, which can sometimes get annoying. Originally I only had the middle shelf and my UKYA shelf, but I then needed to upgrade to another shelf so I could fit all my books on. This is the main part of my TBR pile. It’s organised by genre, but some of them are just randomly on there. I’ve bought the majority of them, quite a lot this year, although some go back as far as last summer. It’s so daunting because I have no idea when I’m going to get around to reading them all but I also can’t bear to get rid of any of them. I also have sequels to the first books on there, when the first is still unread. I need to stop buying books! 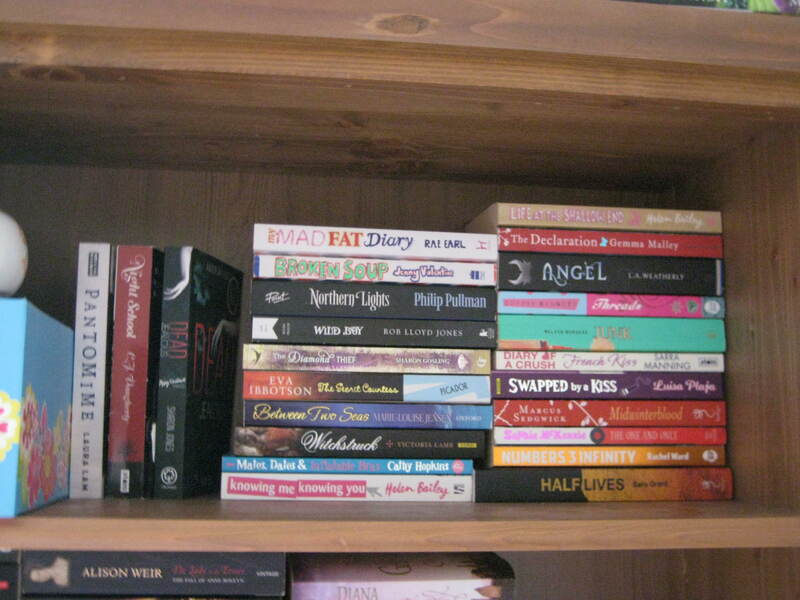 This is the other section of my TBR pile- my UKYA TBR. I know that at least one of these stretches back to two or three years ago which is VERY scary! 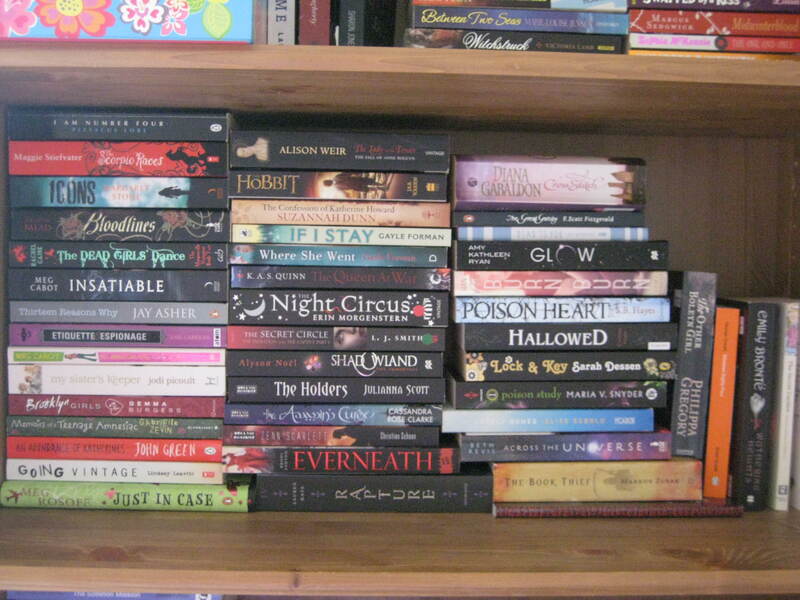 I need to organise this better somehow because I often overlook it for my other TBR section. Some of these books look so good and I want to read them so bad. I WILL read them soon! I also have multiple copies of some books, and I often get asked why when I post book hauls and videos to my YouTube channel. Sometimes I’ll find my favourite books for cheap in charity shops and so I can’t resist buying them and I’ve been given books sometimes, too. 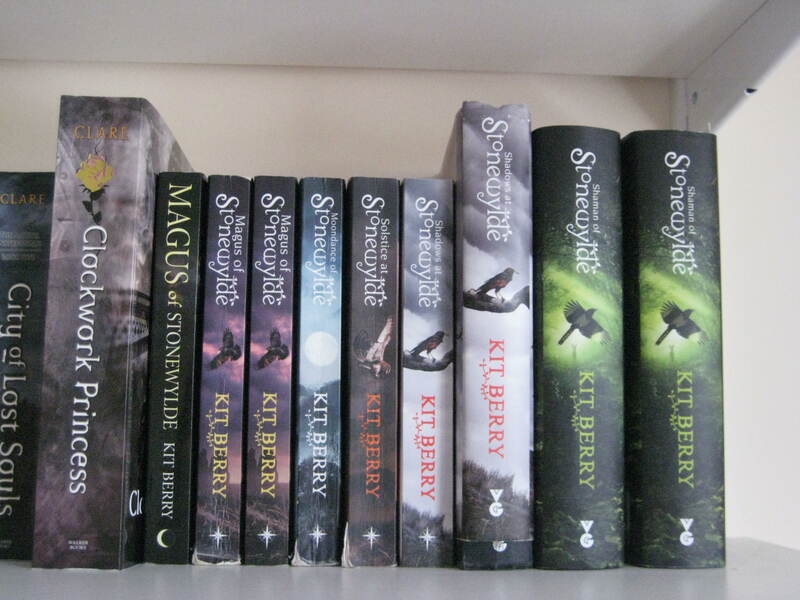 These are my copies of the Stonewylde series by Kit Berry which is probably my favourite series of all time. They were first self-published so I have a self-published version of the first copy and then two of the traditionally published copies. I sadly don’t have multiple copies of the second and third books but I’d love to get hold of the self-published editions from somewhere. I then have a paperback and hardback of the fourth book and two copies of the fifth. One of the copies of the fifth book hasn’t been read and is my baby. I won’t bend the spine and hardly ever touch it for fear that I’ll damage it in some way. Most of the copies are signed, apart from four because I’ve met the author twice now. I bought the other four after I’d met her. I think it’s clear that I need to stop buying books and need to clear out some of my books to allow room for new ones. I am going to have to go on a book buying ban but it will probably pain me to do it. I want to see your shelves now! How big is your TBR pile? Are you a book buying addict? Tweet me a picture using the #bookaddictsunite hashtag! Ohhh I see Burn for Burn AND Thirteen Reason Why on your TBR shelf!! You should def. read those ones 🙂 I have a book problem also but mine aren’t as organized as your… I wish they were! I need to get to IKEA and get some nice shelves! I’ll tweet you a pic of some of my disorganization though!! Both do sound good so I’ll make sure I get around to them soon now that you’ve told me. I did see your tweets and really like your shelves. I got my shelves from a DIY store and they’ve been really good so far. Sometimes it is more of a burden than a delight. It means a lot of dusting and sometimes you can have too many books. Thanks for stopping by, Francoise! Thanks for sharing your bookshelves! You have a lot of awesome books! (I see If I Stay on your TBR, one of my fave books!) At least your are organised with your TBRs. Mine…not so much! I share the same addiction, my books have to be split between 2 houses!! I have a bookshelf at my parents that is full with piles all around it then at my house I have the whole underneath of the bed and also the full side of one of those over head bed cabinets. It hasn’t stopped me ordering 6 books this week though. I have tried the whole book banning thing but it just doesn’t work, guess I’m just gonna have to learn to read faster. If I don’t ever see myself re-reading a book again I have been trying to be good and give them to charity shops or donating to the library. This made me laugh! I love seeing other people’s shelves and I definitely lol’ed when I got to your section about having multiple copies of books. I’m not that kind of person as I prefer to save money whenever I can (so I can buy MOAR of other books…heh heh) but I don’t actually have that many physical copies of books – I prefer having them all on my Kindle because it’s much easier. I don’t have that much extra space in my room so what I can save, I do. 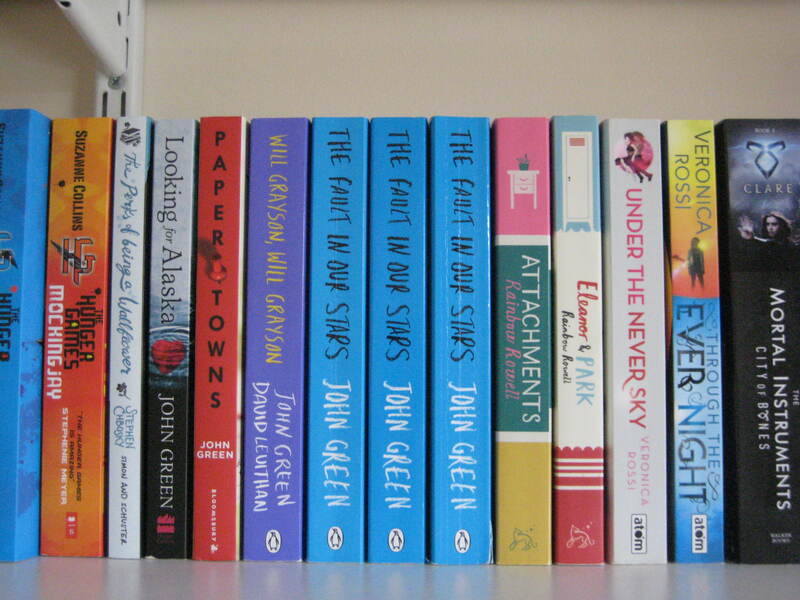 OMG YOU’RE NUTS WITH ALL YOUR COPIES OF TFiOS!!! (but I am secretly jealous) I spot so many epic titles there! Totally coveting your shelves. Do you buy stuff on Kindle too, or prefer to have a physical copy? Good to see my friend Rae’s book top of the pile. I shall send her a link to this post! I love having a nosy at bookshelves! I think all bloggers have a buying problem, its in our genes 😛 I actually dont even own one copy of TFIOS, let alone three! 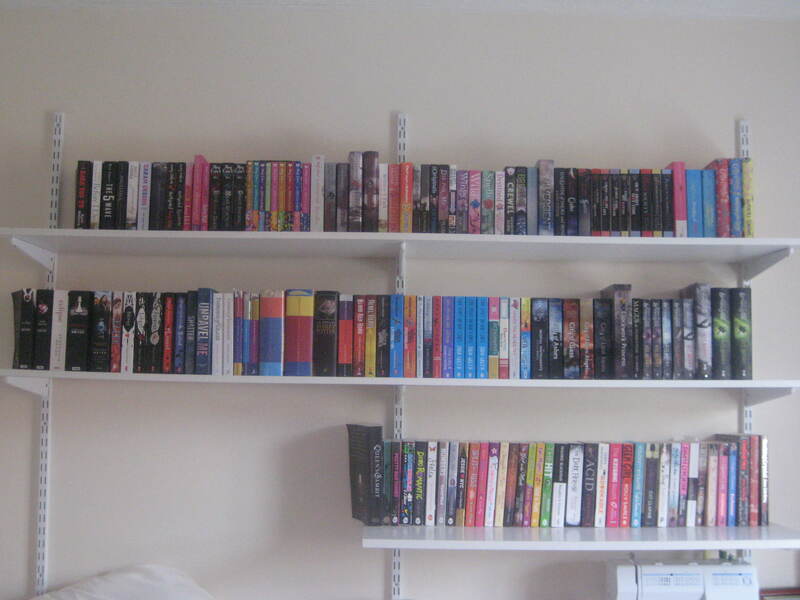 At least youve got two shelves of books youve read; mines virtually all unread! This may sound weird-but I love your white shelves and how your books are organized on them. It’s nice to have the books that need to be read separate from books already read, but I’m like you-I have so many TBR books! I have been placed on a ban simply because we don’t have space for any more books… At least until we get wall shelves up or another bookcase! Haha, that’s quite an impressive bookshelf! I should post mine sometime. I get most of my books from the library to cut back on spending- then end up buying the books that I loved anyway! I love nosying through other people’s bookshelves, thanks for posting! You do have a lot of books! But I can only look at your shelves with greedy eyes, haha! I also see we have the same editions of Harry Potter. My Half-Blood Prince is a different edition too. And I’m excited to see what you think of Across the Universe and Poison Study! Celine recently posted…Book Talk Topic: He Likes Me, Too!